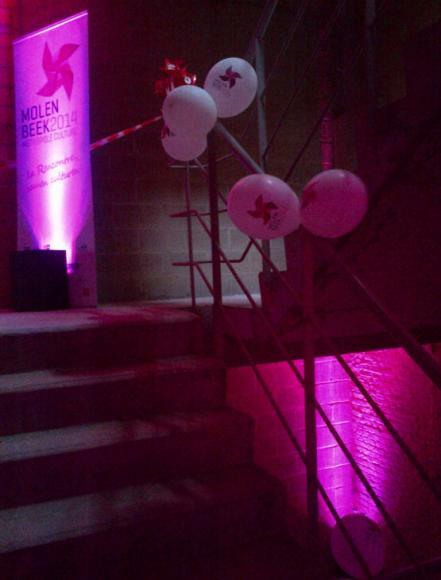 Molenbeek, Cultural Capital 2014: ask for the programme! It was in this blend of genres, both symbolic and friendly, professional and light-hearted, that the detailed programme for the first six months of the operation ‘Molenbeek, capital of culture 2014’ was presented to the press. It was a kind of pre-departure event to get things off on the right foot, attended by, among others, two ministers and a whole host of local, regional and municipal elected representatives, including the mayor, who wore a little black and fuchsia-coloured top under her black leather jacket, and dozens of other figures from government, cultural life and civil society. In all there were over a hundred people present. After Liège in 2010 and La Louvière in 2012, Molenbeek is the first Brussels municipality to bear the title of ‘Capital of Culture’ in the context of the competition run by the Wallonia-Brussels Federation every two years in order to showcase the cultural vitality of a municipality in Wallonia or Brussels. As we were reminded by the operation’s coordinator, Pierre-André Itin, the mayor and the Ministers of Culture of the Federation Wallonia-Brussels and the French Community Commission of the Brussels-Capital Region, the key characteristic of this project – the strength that led to its selection – is this determination to get local people involved, to create encounters, to make culture accessible, to develop the talents, places and energies of the municipality. Involving the local population will also be central to much of the cultural programme which will run throughout 2014 and which will be almost completely free of charge except for a few shows. There will be projects such as Rap (a rap song created by local young people), Photomaton (‘Photo booth’ – a portrait gallery running throughout the year), Reporters en herbe (‘Budding reporters’), Un quatuor dans ma classe (‘A quartet in my class’ - work in schools), MolenNews (a video reporting competition), 1080 West Side Story 2 (an amateur musical), etc. But ‘Molenbeek, Capital of Culture 2014’ will of course also feature flagship events like MolenStart, the inaugural event on 25 January 2014; the MolenDance festival from 5 to 26 April 2014, which makes use of the talents of the renowned choreographers present in the municipality; the showcasing of Molenbeek’s section of the Canal Area with MolenCanal on 26 April 2014; and the MolenZik musical weekend from 20 to 22 June 2014.